Paul Reiser's new series on Hulu tells a fictional back story of the making of "The Tonight Show" in the early '70s. Here's Johnny! 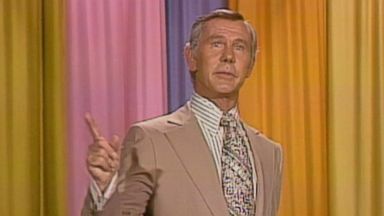 Reporter: 25 years after taking his final bow, tonight Johnny Carson, king of late-night, was back on TV. Well, kind of. Is that really love, or the applause sign? Reporter: A brand-new show called "There's Johnny." This group looks like a bunch of rejects from magic mountain. Reporter: Set one set of his early '70s "Tonight show" just draped on hulu. Actual clips of Carson and a fictional back story and cast of characters woven behind that curtain. Tony Danza, a frequent tonight show guest back in the day, plays Carson's long-time producer Fred. You little commie pissant? It was a real presence in our lives. Everybody went to bed with this guy. It was -- that's what you did. What if we were there behind the scenes? Reporter: Yep. This was Paul Reiser's idea. I don't have that many ideas. But when I have an idea and I think, this is really good, I will hold on to it. Reporter: He was in "Aliens." "My two dads." "Mad did. You." "Stranger things," "Red oaks," and "There's Johnny" for hulu. My goal is to be ultimately everywhere. Reporter: For this dream riser needed this guy on board. I wasn't sure that it would work. What finally convinced you, then? Because Paul would not stop bugging me. Reporter: Jeff saltsing, Johnny Carson's nephew, keeper of the legacy and the rights to footage. My job on "The tonight show" was the receptionist, I sorted the mail. Reporter: Ian Nelson's late Andy, a kid from Nebraska who stumbles into the gig of gofer. I have this letter here. This story is about, what if your biggest dream came true? Andy is the surrogate for the audience. We see this world through his eyes. Partially, at all, not at all, based on you? A little bit. Reporter: And Carson himself? There were definitely some times where we had an actor dressed like him, with a wig like him, soft focus, in the background. Reporter: But no one actually plays Carson full frontal and talking. To have a guy that looks sort of like Johnny, imitating him, is going to look cheesy. Reporter: So old clips of Carson are cut with newly shot, imagined behind the scenes. It was advances in cgi technology and his detailed cataloging of the Carson Canon that convinced saltsing the time was right. Paul would say, we need some jokes about Vietnam. And we're able to do that. Other times I was a kid in a candy shop, I wouldust start watching clips. They're all cataloged and archived. I'd say, I love George Carlin, let me find some. Reporter: One writer has a terrible joke. Even he's voting for Nixon! Reporter: But it makes the monologue and the payoff is Johnny Carson actually delivering that joke on "The tonight show." But even he's voting for nix Nixon. That's got to be kind of tough to get that. The back story is made up? Correct. But the real joke actually did bomb? That's correct. That's correct. It appeals to a whole big swath -- swatch? Swath? Swath. I'm not going to use the word. Swathe? Swath? One of the thing that excites audience. Reporter: Aiming car sew fans and neophyte hulu-guzzling millennials. When I first got the audition, I didn't know who he was. You were born in the '80s? '95. What? Yeah, Carson was off the air for three years when I was born. Cis-boom-bah. Describe the sound made when a sheep explodes. Reporter: He's now read every back, watched clips, become a big fan. Now compares the current crop of late-night yakkers to the godfather of them all. Give me a break, I'm so lonely! You watch any of them and then you watch an episode of the tonight show with Johnny Carson from 1965, he did it. He did everything they're doing first. Reporter: Okay, people. Favorite moments? Any time he was on with Rickles. Well, I realize -- I, I, I, I! I, I, I, I! Ed Ames and where that tomahawk landed. He just grabs it. Like don't take that out, we're going to sit here and milk this. We do one in the show, a famous one where the dog doesn't want to eat. Reporter: The dog won't eat or play. So Johnny takes his place. I don't even know if there were moments so much as U.S. Just the continuum, the fact that he was there. The thing that made him really special was how he treated his guests. He wanted you to shine. Reporter: Paul Reiser was a guest many times and treasures this particular moment. Is there currently a lady in your life? I sort of threw in an ad lib that just really made him laugh. And he took a moment. Then he went back in his chair. And I was sitting there going, that's the best I'm ever going to get. Yes, I've been living with the woman of my dreams for a year now. If you'd have said that 25 years ago on television people would have gone -- Sure, I would have been 4. I remember sitting there, I don't know how long, it felt like an eternity, such a big laugh. I don't know what I do here, do I stand up and take a bow? Because this is pretty good, this is pretty fun. I just remember sitting in the warmth of that going, uh-huh, Johnny Carson just laughed. Reporter: I'm Nick watt for "Nightline" in Los Angeles. "There's Johnny" streaming now on hulu.